Green and orange signs filled the air in the Bates Academy cafeteria. The students of this K-8 school made their voices heard, but not in the typical way you’d imagine for young children. No, the third- through fifth-graders here engaged in a silent protest, putting their thoughts on paper instead of shouting them in the air. The topic causing the stir: salad. “Give us our salad,” read one sign. “Salad for all,” was written on another. “Elementary wants real salad,” declared a third sign, this one with seven exclamation points, driving the message home. Earlier this year, the Bates Academy was awarded a salad bar as part of the Salad Bars to Schools grant program. Initially, the bar was only available to older students in grades six through eight, but this limited availability did not sit well with their younger peers. Conveniently, some of these younger students had just finished a social studies unit on peaceful resistance, and they immediately knew how they could bring about change. 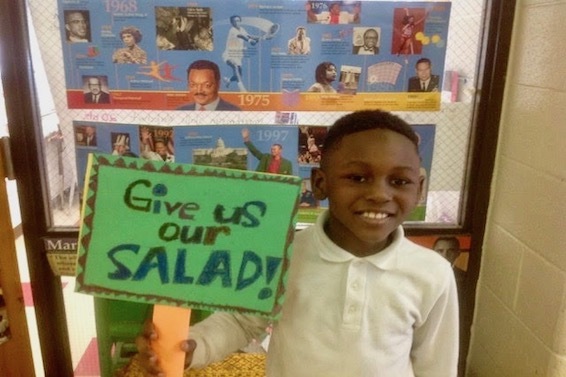 With help from their teachers, the students in grades three through five constructed signs, highlighting their frustrations with their limited access to the salad bar. They then proceeded to picket in and around the cafeteria, silently, though completely unified. Ultimately, their efforts were a success, and on April 7th, the younger students were given access to the highly-prized salad bar. Since then, the students are full of smiles as they come through the lunch line, assembling their colorful and nutritious plates. The protest signs quickly vanished, and the kids learned a valuable lesson: that peaceful resistance can lead to great change.